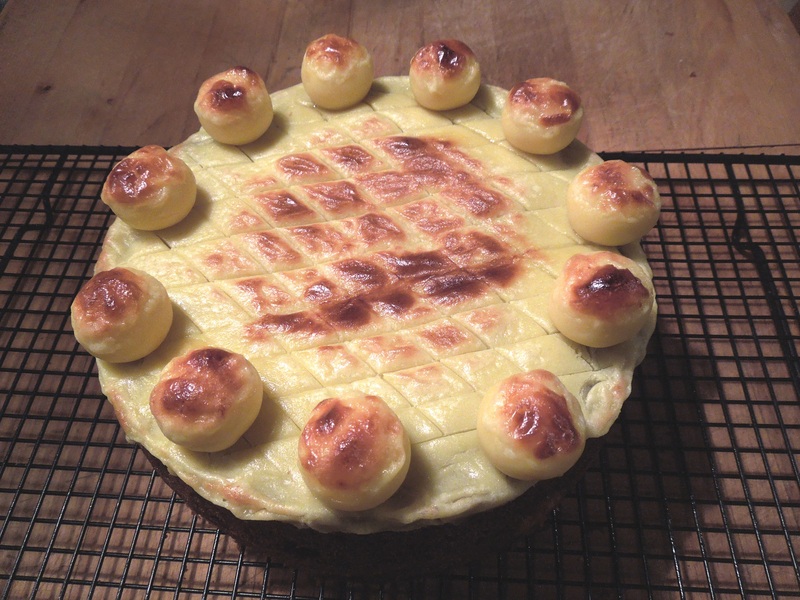 Simnel cakes have been around since the Middle Ages and records show that back as far as the 18th century servant girls would be allowed to raid their employers’ larder supplies to make one to take home for Mothering Sunday. They’re also known these days as Easter cakes. A fruit cake sandwiched and topped with marzipan, the Simnel cake used to be decorated with fresh or crystallised flowers. Then the Victorians introduced a new tradition of putting 11 (or 12) little marzipan balls around the edge of the cake, to symbolise the Apostles (plus or minus Judas). As a firm believer in overkill, I’ve done both. This recipe, used here with permission, comes almost in its entirety from the sainted Mary Berry’s Ultimate Cake Book. Buy this and Pam Corbin’s Cakes and you will never need another cake cookbook again. Probably. Grease and line the base and sides of a round, deep, 20cm cake tin with greased greaseproof paper or use a proprietary cake release product. (I only had an 18cm tin deep enough so I used that and cooked the cake for a little longer). In a big bowl, cream the butter and sugar until pale and fluffy. Beat in the eggs a little at a time then gradually sift in the flour and mixed spice, mixing as you go. 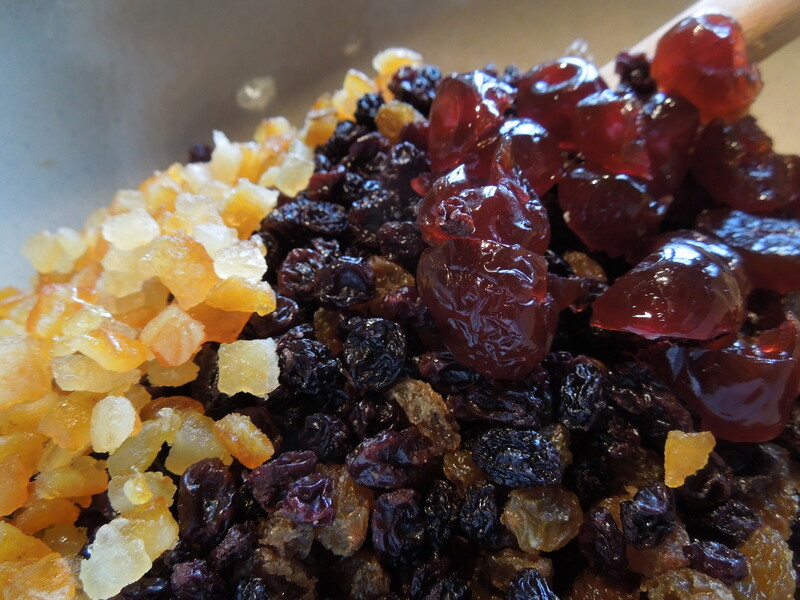 Add the dried fruit, peel and lemon zest and give it all a good stir to distribute the fruit evenly. Put half of the mix into the cake tin and level the surface. Roll out one third of the marzipan into a circle the same size as the tin (easiest done between two sheets of greaseproof paper or baking parchment) and place it on top of the mix. 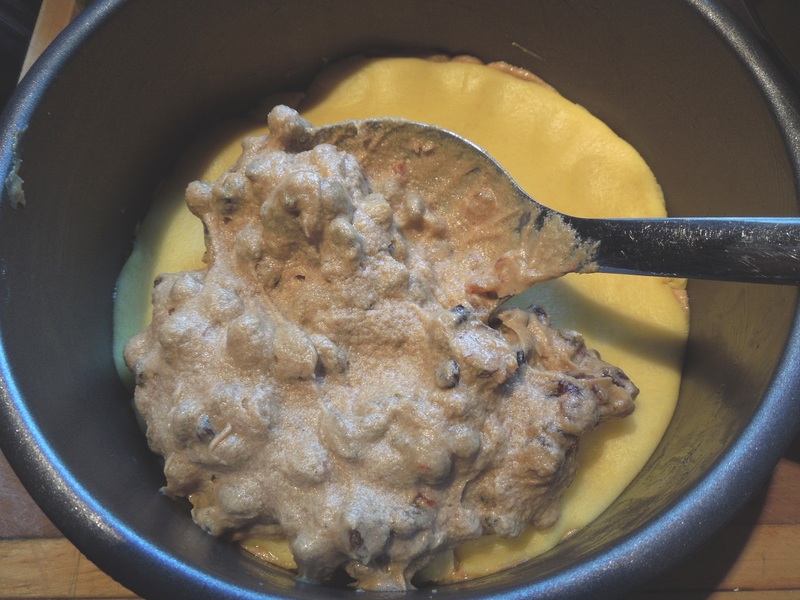 Spoon the remaining cake mix on top and level the surface. Bake for around 2 1/2 hours or until the cake is well-risen, has browned evenly and is firm to the touch. If after 1 hour’s baking the top is getting too brown, cover it with foil. Allow the cake to cool in the tin for around 10 minutes before turning it out onto a wire rack. Once it’s cool, warm the jam and brush it over the top of the cake. 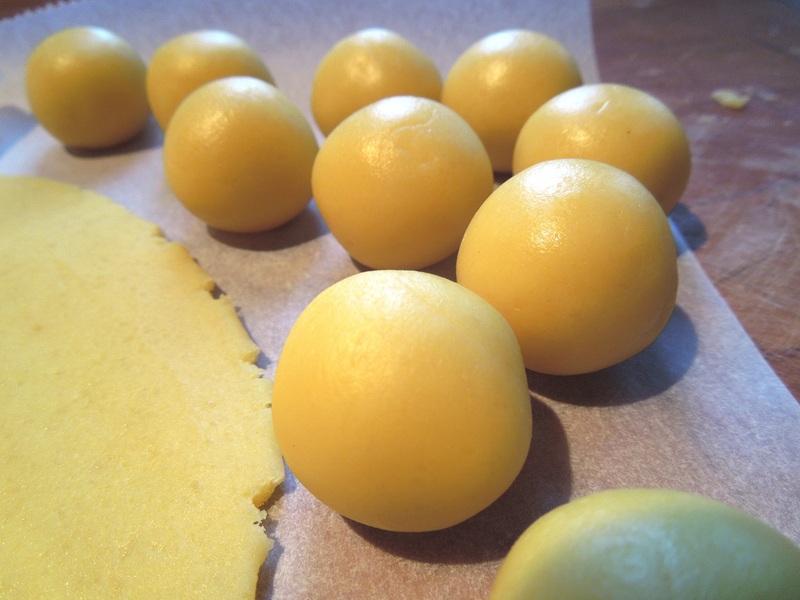 Roll half of the remaining marzipan into a circle to fit the top of the cake, then roll the rest into 11 equal balls between the palms of your hands. Press the circle of marzipan firmly on top of the cake and crimp the edges to decorate. Mark a criss-cross pattern on the marzipan with a sharp knife and brush with beaten egg. Place the balls evenly around the top edge and brush them with egg too, then pop the cake under a hot grill until the marzipan is turning golden brown. Decorate the centre with crystallised flowers – you can find the method here if you’d like to make your own. Have a happy Mother’s Day. 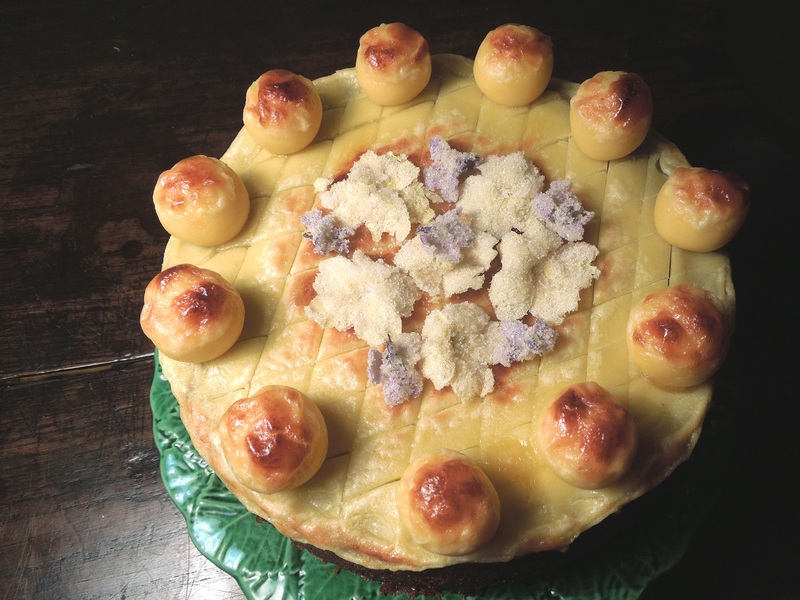 This entry was posted in Desserts, cakes and biscuits, Vegetarian and tagged Easter cakes, fruit cake, marzipan, Mother's Day, Mothering Sunday Simnel Cake by Linda Duffin. Bookmark the permalink. Thanks – not my strong point either so it’s nice when they work out. Simnel comes from the Latin “simila”, with reference to the fine, white flour used, or so a Google search informs me. Nothing to do with Lambert Simnel, which would be far more entertaining. I don’t think the Victorians did rehabilitation, did they? It’s very more-ish, I must say. In fact we’ve just eaten the last few slices. Slipped down a treat with a nice cuppa! Lol, yes, not quite as high a status as king but better than losing your head. I’ve got a fabulous book of Tudor recipes I have a yen to turn my hand to. Watch this space. Thank you on both counts, that’s very kind of you – I’ll check out the site soonest. Um. Am I missing something? How many eggs? No. Just perfect. It’s in the oven now, with – as I’d suspected – the correct number of eggs. All good!